A recent conversation with a good friend left us in square disagreement about the validity of violence for Christians. You have heard that it was said, ‘An eye for an eye and a tooth for a tooth.’ But I say to you, Do not (violently*) resist the one who is evil. So is my friend right? Was Jesus really violent in this episode? Did he really lash out at people in a harmful way? I suppose there could be a whole debate around the question of what violence actually constitutes. Is all force to be considered violent? What about threats? Such a semantic debate, however, must be reserved for another time. Moving back to John’s Gospel, let us begin to interpret this verse with a consideration of the Greek grammar and words involved. Some English translations (KJV, CEV, MSG, NASB, NKJV, NLT) translate John 2:15 as having the equivalent meaning as the ESV quoted above, namely that Jesus constructed a whip of cords and drove all the people out of the temple, as well as the sheep and oxen. Interesting. According to this translation Jesus did not use the whip against people, but used it solely to drive out the animals. The first option makes more sense of the fact that pantas is in the masculine gender (so Morris, Witherington and the majority of modern Western scholars). The second option makes more sense of the te/kai construction, which could be summarised as meaning “both … and”; this is used reasonably often in the New Testament (around 35 times I believe). I opt for the latter (nonviolent Jesus) reading, though this is not because I wish to twist Jesus into being nonviolent when he is not (one may need to consider accusing the NIV translators of the same thing…). Moreover the first reading makes little narrative sense in that Jesus scolds the dove sellers subsequent to his whip-cracking; he has hardly expelled “all” from the temple courts if they are left standing there. In conjunction with this point is the fact that the temple court was a massive space – 300m wide by 450m long – and it is unlikely that John’s account of Jesus driving everyone out is historically true, for this would have been an impossible task. That John recorded such a detail and expected his audience to digest it would be strange if he were referring to Jesus expelling the people and not merely the animals. This is of course unless all his audience were completely ignorant of the temple, which is unlikely. It also makes more narrative sense if Jesus has sent the animals running rather than people. 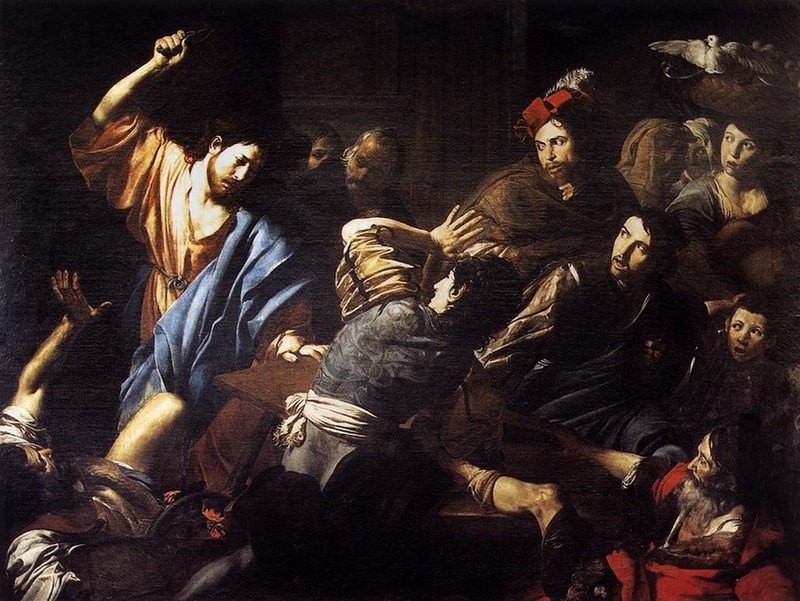 After all, Jesus’ next action is to send the money sprawling – he scatters the capital of the money-changers, and it isn’t hard to see the dispersing of the animals as a parallel scattering of “capital”. In other words, the animals and the money are equivalents representing temple currency. Additionally it is unlikely that Jesus’ whip was anything significant, let alone a scourge like those used by the Romans. We must remember that weapons were banned from the temple, and this would explain why Jesus fashioned a whip while already inside. A whip of cords (or “ropes”*^) was likely small, such as those used in animal farming, as opposed to warfare. This would leave Jesus free from violent action, a picture far more consistent with his other teachings, such as Matthew 5:38-39. Hopefully these rough thoughts help someone out, or expose people to a reading of John 2:15 that they have not yet considered. * Though there are no English Bible translations that render the Greek antistēnai (“resist”) as “violently resist”, this is the most common meaning of the word. Indeed, antistēnai was a military term; out of 71 uses in the Greek Old Testament, 44 refer to military encounters (“rise against” type of language). In Mark 15:7 and Luke 23:19, 25 antistēnai refers to Barabbas’ murderous involvement in the “insurrection”, while Acts 19:40 describes the townspeople of Ephesus being in danger of being charged with antistēnai, rendered “rioting”. In any case Matthew 5:38-39 supports the rejection of violent action – either by doormat pacifism (do not resist evil at all), or by active nonviolent resistance (do not violently resist evil i.e. resist evil by other means); it is just a matter of what kind of resistance Christians are allowed to engage in. ** The GNB is more forthright; “So he made a whip from cords and drove all the animals out of the Temple, both the sheep and the cattle…” The Good News Translation is, however, not a good example due to the nature of its purpose – it is a simple translation allegedly designed for people who speak English as a second language. For this reason it cannot be said to be the most accurate translation (much like the Message). It does, however, serve its purpose well. ^ Leon Morris concedes the “te … kai” construction should mean “both … and”, though he concludes the violent Jesus meaning of John 2:15 is correct overall because of the gender of pantas. It seems an odd choice to forego the obviousness of the meaning of the “te … kai” construction in favour of an apparently more “natural” reading. ^^^ C.H. Dodd, Historical Tradition in the Fourth Gospel, (Cambridge: Cambridge University Press, 1963), 156 n.3. *^ In Acts 27:32 the same word (schoiniōn) refers to ropes on a ship. 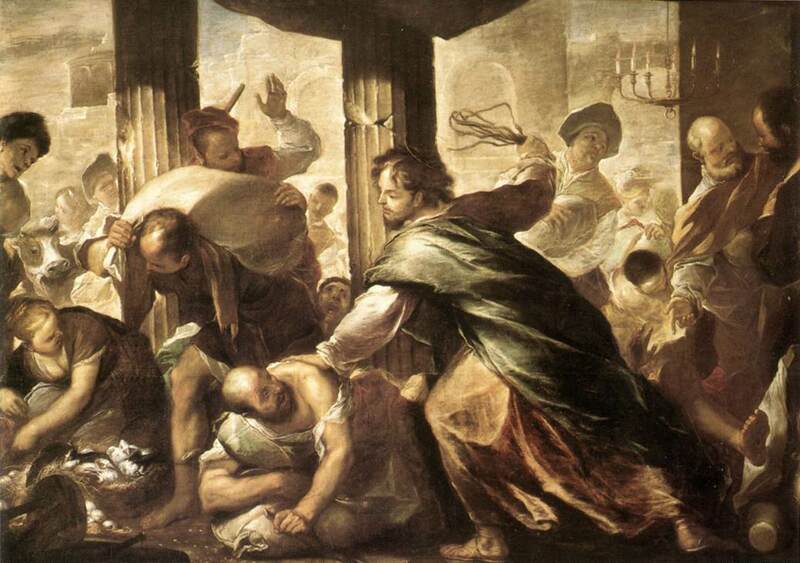 Posted on June 22, 2011, in Conflict and Nonviolence, New Testament and tagged Cleansing of the Temple, Jesus, John 2:13-17, John 2:15, Nonviolence, Violence, Whip of Cords, Whipping. Bookmark the permalink. 18 Comments. Thanks for this post. I’ve really enjoyed reading your blog and appreciate your perspective on a number of issues, particularly this one, as your view is quite different to mine. My question (not a trick one I should point out) is how you reconcile the image of the non-violent Jesus of the Gospels with the recurrently violent image of Him portrayed in Revelation? My point is that if Jesus’ character is one of non-violent resistance, must that not consistently be His character throughout the ages? Are you arguing that He is specifically calling us to model His non-violent attitude demonstrated in the Gospels but ignore (or at least disregard for the moment) His violent responses in other parts of the Bible (in a Deuteronomy 32:35 sense)? This certainly gets back to your point about what constitutes violence. I definitely read a correlation between Jesus’ violence and His perfect justice…an aspect that we certainly lack. This may be a subject for another post, but would love to know your thoughts. Good to hear from you. How is the land of the Kiwi? I really LOVE this question! With your permission I’d love to use it as a new Q&R post topic. I feel like others will have similar questions, and I cannot do justice to it hidden away in the comments section. Currently Wellington is windy and wet…no surprises really. Yep no probs, go for it. Deut 32:35 is done by God the Father and *not* by the Son of God. God the Father said, “a tooth for a tooth and an eye for an eye” in the Holy Old Testament and it was the job of the State and NOT the individual. The State had the right to kill in war and death penalty and the individuals were forbidden to kill, that is murder. The Son of God said, “You have heard that it was said, ‘Eye for eye, and tooth for tooth.’ But I tell you, do not resist an evil person. If anyone slaps you on the right cheek, turn to them the other cheek also.” All killing is forbidden in the Holy New Testament for Christians: murder, death penalty, and war. Christ abolished the State for Christians (Jewish, who were under Mosaic Law and Gentile, who were under Noahide Law) and Apostle Paul stated that Christians are to follow the Law of the Land that they lived in. If in Israel, then Jewish. If in Roman Empire, then Roman. Rev 19:11 is spiritual war just like in Ephesians 6:12. For the first 300 years Christians were non-violent and peaceful until the wolf in sheep’s clothing Augustine changed the meaning of Christ’s words: it is for Christian individuals but NOT for the Christian State. What Christian State is he talking about?? Christ abolished it! He also taught anti-Semitism, misogyny, and slavery, which are anti-Christian. Galatians 3:28 There is neither Jew nor Gentile, neither slave nor free, nor is there male and female, for you are all one in Christ Jesus. The Apostles just like Christ did NOT resist the evil person and as a result died! Do you think that God can NOT send a legion of angels to protect Christ or the Apostles from the evil people? As for the whip, it can NOT kill BUT it is good for discipline. A father who loves his child, will discipline his child. Christ loves all people, even His enemies; so, he disciplined the people. It is physical BUT it is in no way, shape, or form defensive violence (i.e. resistance) and MOST definitely NOT offensive violence. Thanks for taking the time to write your thoughts in this post. I agree that violence will not provide long term solutions to the issues facing our world – nor is it the example given to us in the life of Jesus. I had the privilege of meeting an Iranian Pastor last week who shared his testimony about his encounter with the love of Christ. Prior to his conversion he was the head of a well known extremist group which was full of violence fuelled by hatred. As he shared about the transformation in his own life I understood that the use of violence against violence will never penetrate the deep hatred in someone’s heart. His personal testimony was a great affirmation of your more recent post citing Ched Myers on June 16. If violence is a God given right for a Christian to protect their faith, then who and what are we protecting it from? Is it our enemy? Who is our enemy? Was it Osama Bin Laden? Now he is dead is it someone else that we feel threatened by? The bible tells us that our enemy is not flesh and blood (Ephesians 5:12). Our enemy is anything that sets itself against God’s creation. Despite the incredible backlash Brother Andrew received from many Christians in the West when he made contact with the Hamas in their time of need, God uses him powerfully to proclaim the Good News to those whom many Christians in the West would rather see dead. Here is a snippet of an Open Doors interview given by Andrew on January 6, 2009. It is stories like this that bring me to a place of questioning my own capacity to love. I have often asked myself the question, what stops me from expressing Gods love toward others? How often did I pray for Bin Laden? Isn’t this the weapon of warfare that I read about in the New Testament? Would I be so bold as to love someone who could take my life? If I am honest with myself, more often than not my capacity to love is limited by my own selfish desire for comfort. Perhaps we need to take note from this passage and ensure our churches are not houses of trade – and that our ministries are not services of chattel. Thank you for your thoughts about Jesus. It is rather hard to find thoughts which stick to the subject of Jesus, without straying the subject into narcissistic self-help. I’m sure this event caused a riot at a time when upwards of 100,000 people had swelled the city for Passover. I like to meditate on this with common sense: How would you drive oxen from a building courtyard; with a fly swatter? How would you cause a stampede of hundreds of sheep to go in the opposite direction? Even if He didn’t whip the Pharisees and other people in the Temple, they would have been terrified that He would. They couldn’t do anything about it. They couldn’t arrest Him because of His popularity. This event could have been the culmination of His frustrations with ‘sacrifices’. Nevertheless, He did what He saw the Holy Spirit doing, and said what the Holy Spirit would have Him to say, as always. Thanks for your kind comment dar. On a completely different note, I like your blog. Do you think I could have permission to use some of those images for my posts in the future? So you are saying Jesus won’t wield a whip om any human (for scare of being branded Violent???) but would cast a soul into an eternal lake of fire? I find it impossible to imagine that poor people were surrounded by animals and money flying around and that chaos trying to gather them did not ensue. And these were mostly animals and money from greedy, cheating money exchangers who people would not have been prone to help. Also, Jesus was furious at the money changers defiling his Father’s house, not ALL the people. So that offers reinforcement to the idea he didn’t drive out literally everyone. I think if Jesus came back right now and did the equivalent, say disrupted Henry Kissinger or another War Criminal’s memorial at the National Cathedral or The White House by causing a stampede (maybe a harmless smoke bomb), he would be America’s next political prisoner on death row. Hi there. I came across this post while doing research for a Bible study. I led a small group on this study last week, and someone suggested that the whip was intended for the animals. As an unblemished animal was required for the sacrifice, for Jesus to make small lesions on the animals’ backs with a whip would make them unfit for sacrifice. As such, Jesus is dismantling the temple traders’ ability to make profit, while not doing either the animals or people any significant or lasting violence. Have you ever heard this interpretation before? I have grown up attending church, and just completed an M.Div, but this was an entirely fresh perspective for me. I can tell you he did drive out the merchants with their livestock because I know how much livestock is worth! A whole lot! This was not some made up story with actors that just sat there as their livestock were being whipped and scattered. He drove them out and then gave the dove merchants a good talking to. Plus the word “whip” is coming from Greek and Latin “flog”, that is for flogging men. In the big picture there are souls that Jesus is going to cast into the lake of fire. And, Luke Chapter 12 tells us that “The Lord’s” servants are going to be beaten with stripes, some many, and some few. Did it ever cross your mind that there are those that just genuinely want to live in peace and without sin. And that sometimes peacekeepers have to stop these evil doers. Did it ever cross your mind that there are demon posessed individuals on Earth that genuinely just want to kill you. Did it ever cross your mind that it makes God sad when good people are raped by evildoers. “Blessed are the peacekeepers.” Christ said that. I worship the same Jehovah of the Old Testament that has saved me from sin! The same Jehovah that gave the Israelite’s the authority to claim the Holy Land from the unholy pagans! I am a Gentile convert with tattoos and believe I am forgiven! I believe that Jesus only ate clean meat, and you have been totally misled once again if you heard otherwise. You can grasp the one true gospel message when you stop being so prideful, and take the time to humble yourselves, and learn, and read the Holy Bible in it’s original form of Hebrew and Greek. What denomination am I? What denomination does this Bible of ours say I am? Stop living in half truths and someone else’s translation that is full of hypocrisies, lies, and ignorance. As in ignore. Yes and I just found that the 3 other gospels of Matthew Mark and Luke do say he drove out the people. That simple. Mark 11:15 (NIV) On reaching Jerusalem, Jesus entered the temple area and began driving out those who were buying and selling there. He overturned the tables of the money changers and the benches of those selling doves, 16 and would not allow anyone to carry merchandise through the temple courts. 17 And as he taught them, he said, “Is it not written: `My house will be called a house of prayer for all nations’? But you have made it `a den of robbers. '” 18 The chief priests and the teachers of the law heard this and began looking for a way to kill him, for they feared him, because the whole crowd was amazed at his teaching. Luke 19:45 (NIV) Then he entered the temple area and began driving out those who were selling. 46 “It is written,” he said to them, “`My house will be a house of prayer’; but you have made it `a den of robbers. '” 47 Every day he was teaching at the temple. But the chief priests, the teachers of the law and the leaders among the people were trying to kill him. Thank you for this. It bothers me how much people use this verse to justify all types of violence in direct contrast to Jesus’ teaching. It always seemed obvious to me that Jesus wasn’t whipping people. 1. What is the purpose of a whip? Look at the history and function of whips. Whips were primarily used for driving animals. That’s basically what they are for. How else are you going to get livestock out of the temple? People want to say that Jesus talked to the animals and whipped the people? I don’t buy it. 2. Why would Jesus whip the people out? Do people believe that Jesus overpowered the crowd in the temple by his physical strength? It was his authority. If someone was willing to resist his words, surely they could resist a whip. My personal belief: Jesus never lied and he didn’t do violence while he walked the earth. 4. Mark 14:55,56 “And the chief priests and all the council sought for witness against Jesus to put him to death; and found none. For many bare false witness against him, but their witness agreed not together.” If Jesus physically beat a temple full of people, wouldn’t some of them have come forward and said so? If he had caused them any injury, it would have easy to find plenty of agreement on that point. If he somehow beat them without injury, then why do people use this text to justify hurting and killing humans? It’s unfortunate that we are so willing to project our own 21st century Western timidity onto Jesus. Jesus cleaning the temple was a miracle.Since archeologists have chairs from that time we know no one could take a cord or cords and use it or them as a whip.Only the son of God could have upset those tables by himself. Well, my comment, to my interpretation is two fold–I believe Jesus was inflamed by the thinking of a bleating lamb torn from his hysterical mother was gods way of forgiving sins. Also the priest were totally exploiting the people as ruling bodies usually do. Now and then.